Seven Dials dates back to 1692 when plans for the area were submitted to Sir Christopher Wren, the then Surveyor-General for London. 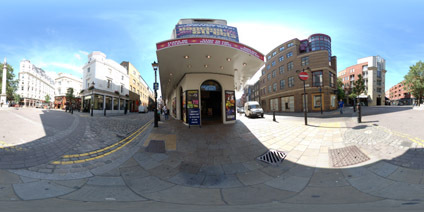 The area is based around 7 streets cumulating in a star shape around the Sun Dial - thus the name Seven Dials. The original Sun Dial was designed by the architect and stonemason Edward Pierce. It remained on the site until 1773 when it was demolished to remove a gathering point for undesirables. In 1984 funding was raised to rebuild the dial signaling the regeneration of the area.